Metropolitan Magazine Amsterdam Travel Map Illustration, Cedar Communications design agency were in touch to commission a map for Metropolitan magazine, which is a magazine from Eurostar. 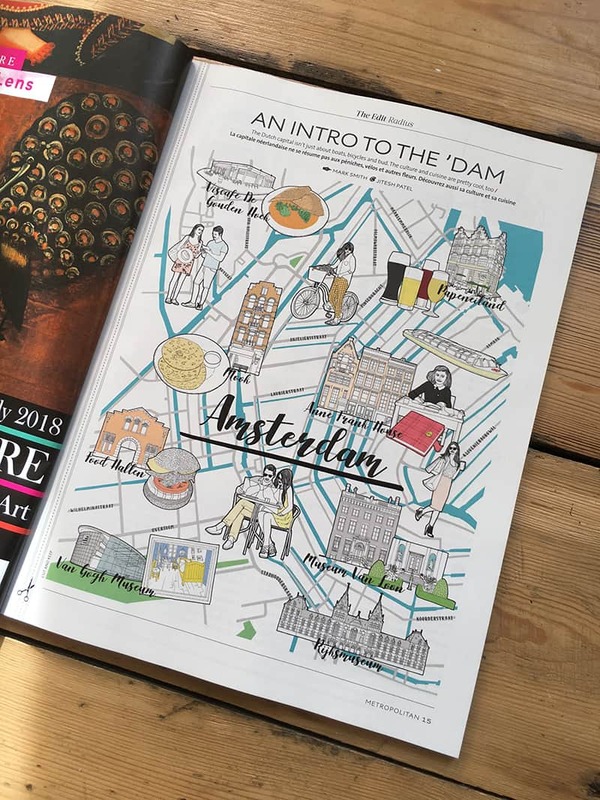 The map commission was to illustrate a map of Amsterdam that combines the highlights of culture and cuisine and not the usual tourist highlights. The illustrated map of Amsterdam brief was to create a pleasing map while at the same time being user-friendly for people to use as well. Viscafe Gouden Hoek – its a stone’s throw away for the lively Westermark’s Sculptures and skateboards, the fish restaurant is a local favorite the has a special Oyster menu and upscale fish and chips being served at this establishment. Rijksmuseum – Five years after its epic renovation, Amsterdams golden age art trove continues to dazzle. Rembrandt’s The Night watch remains the big draw, but there’s much more besides, from intricate battleship to YSL’s Mondrian dress. Papeneiland – Inthe heart of the once working-class Jordan district, this waterside cafe serves a mean apple pie, the interior crammed with oil paintings and fairy lights. De Hallem – I the Oud West district a covered food market multiplex cinema and a parade of independent shops have given a new lease of life to this Victorian tram shed. Now its a bright and breezy hive of commerce and culture.